My bus trip to the office each morning is seldom exciting or interesting. In fact, it endlessly frustrates me, mostly concerning the traffic jams on Elizabeth St. Normally I’m in a vague daze, ignoring most of my surrounds, until I get into the office and grab a coffee from the downstairs café. However, about a month ago, I was awoken from my stupor by the unmistakable tones of Christmas Carols. 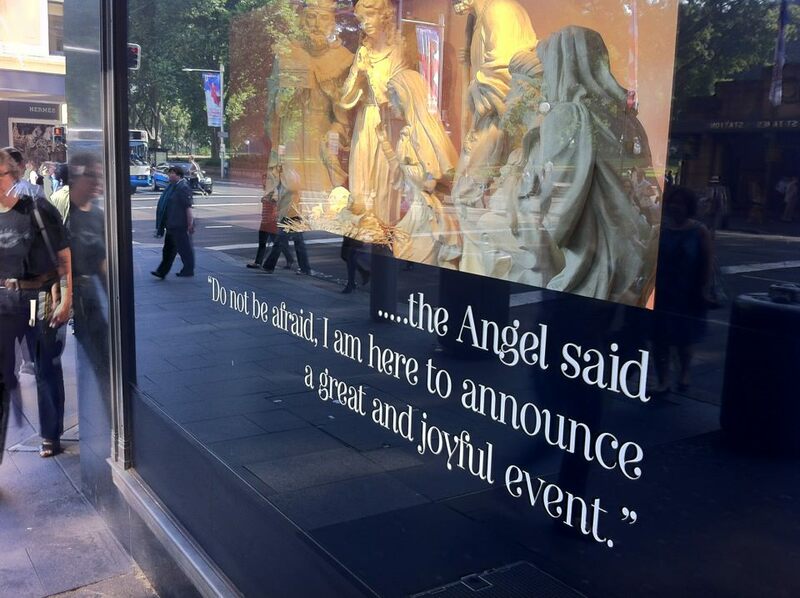 The source was a ‘Christmas display’ in the windows of department store, David Jones. Four of the store’s windows contained puppets acting out parts of the nativity accompanied by four Christmas carols with the words of the carols adoring the window panes. Furthermore, they had a bible verse painted onto one of the windows. This completely blew me away. Was a department store really linking ‘Christmas’ to ‘The Bible’?? Right there, that statement is all you need to know about Christmas in Australia. While the word ‘Christ’ may be in the title, I dare say, to most Australians, Jesus is merely an ‘optional extra’ each Christmas. People everywhere seem to be trying to find any explanation of the so-called true meaning of Christmas other than ‘Jesus’ birth’. Not a ‘Jesus’ in sight. 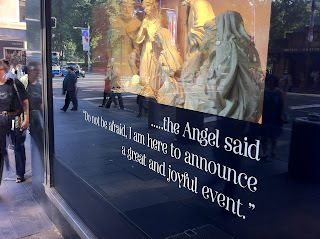 I don’t enjoy getting all ‘preachy’, ‘holier than thou’, or ‘tele-evangelical’, but I do want to say, for the record, that the reason we celebrate Christmas in Australia is because, around 2,000 years ago, the Son of God was born in a manger in Bethlehem. Boom. Right there. There it is. The problem is: I reckon people in Australia don’t seem to want to hear about Jesus. Let me illustrate. My housemate, Tim, goes to a church in southern Sydney and, by all accounts, it’s a pretty good one. The other day, the Pastor of this church was interviewed by morning TV show, Sunrise. Sunrise was filming a story on a group of Christians who pray in the city each Friday. As part of the story, they interviewed Tim’s Pastor who proceeded to say the name ‘Jesus’ every few seconds. In the reporter’s mind – helping people feel included is a good thing. Talking about Jesus, though… well, that’s not so good. It’s a little ironic that this story was broadcast around Christmastime, yet they didn’t want the name, Jesus, mentioned too often. It’s a little like wanting to limit the number of times you say ‘Germany’ when discussing the Eurozone sovereign debt crisis: a little silly. 1: Yo, all you `happy holidayers': Christmas celebrates the birth of Christ. That is all. 2: Again, for the knuckleheads: you're getting a holiday because it's Christmas - the celebration of the birth of Christ. 3: You don't have to celebrate it. You don't even have to believe it. But that's why you're getting it. #Christmas.